The Secret Weapon of Great Leaders. Have you ever experienced in a meeting where a seasoned leader listened intently and then, with exquisite timing, asked one question that shifted the direction, focus and thinking of the entire team? That is the magic and power of questions! To move the needle in your organization in 2016, the first place to start is by asking thought-provoking questions. The 7 questions below are by no means exhaustive. They serve as a starting point to stimulate your own questions. These (or comparable) questions can make the difference between a successful 2016 and a disappointing one. QUESTION 1: What is your BHAG? BHAG stands for Big Hairy Audacious Goal, a concept introduced by Jim Collins in his book, “Built to Last.” It is one of the characteristics that distinguishes great companies from mediocre ones. The best definition that I seen is that a BHAG is a statement of strategic intent. A bigger, bolder, more powerful outcome than goals with a target timeframe of 10 – 30 years from now. It’s your ambitious Mount Everest that you want to climb. Starbuck’s BHAG is to overtake Coke as the world’s leading brand. While asking yourself the question … What is our BHAG? … may sound simple, it’s not always easy to answer. To learn how to develop and test your BHAG, refer to Collin’s book, Built to Last. QUESTION 2: For what purpose ….? When I work with leaders, one of the first things I want to know is the underlying motivation for a particular goal, decision, behavior or even emotion. It forces you to chunk up, get out of the weeds and see your situation with a wider lens from a higher elevation. It can uncover your unconscious beliefs about cause and effect relationships which may or may not be true. It can uncover whether the underlying reasons for your goals/decisions are for healthy or unhealthy reasons. With each 2016 goal, ask yourself … For what purpose do you want to achieve that goal? With each response, ask … for what purpose? … again. It will help shed light on the following. Are you choosing right goals for right reasons? If they are the right goals, are they for healthy or unhealthy reasons? Are there better goals for better reasons? Oftentimes when companies decide on new goals, strategies or initiatives, they ASSUME they are the right ones. Challenge that with this question. QUESTION 3: Is your ladder against the right wall? This is one of my favorite questions to ask at least once a year to make sure my goals, decisions and actions are always aligned with my greater purpose. 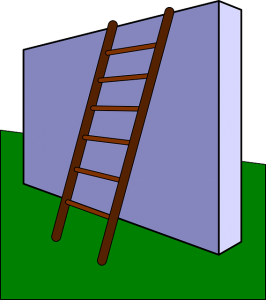 How do you know if your leadership ladder is against the right or wrong wall? Do you wake up in the morning excited about your 2016 goals? Are your leadership and organizational goals primarily focused on moving up the ladder or do they also serve a greater good? What comes first when making leadership decisions – profits or purpose? What difference do you want to make in your role? Are you realizing that difference? If you or your company are experiencing success without a sense of significance, it’s time to put your ladder against a different wall. QUESTION 4: What’s at stake? Defining your leadership or company goals is the easy part. Sustainable focus and drive to achieve them – no matter the challenges – is the hard part. By continually asking the question — what’s at stake? – you will..
Below are specific variations of this powerful question to get you started. … to your company if you don’t achieve your goal this year? 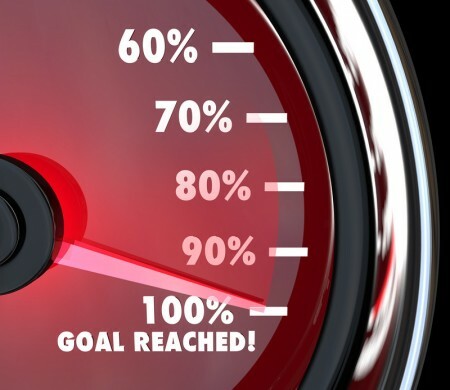 … to other stakeholders if you don’t achieve your goal? … to your company culture/values if you do achieve your goal? Will your culture possibly be compromised? Will your goals compromise other company priorities? QUESTION 5: Are you solving the right problem? As a leader, you probably spend considerable time solving problems. Perhaps to the point where you get nothing else done. Because leaders are action-oriented, the tendency is to jump right to a solution, ASSUMING you are solving the right problem. Yet doing so could cost your company significant resources, time and money. Plus you most likely have not solved the real problem. I learned this invaluable lesson when I was an executive at US Sprint in the early 1980’s. The company was growing 200% for 5 consecutive years. I got a monthly report of all the key problem areas across the company. One of the key metrics — # of customer complaints – was sharply increasing. The customer service department wanted to hire more customer service reps. Yet after digging deeper and asking the question – what’s the real problem, it became clear that engineering’s challenge to install enough transmission capacity to meet the dramatic growth in demand was the real problem. QUESTION 6: Is your timing correct? Timing is EVERYTHING in business. Timing can be the difference between success and failure. It can make or break a product launch, change initiative, new technology or even growing your company. Yet, for even the best leaders, timing is often an afterthought. I see it happen often. Be honest with yourself. For this year’s projects, goals, decisions or initiatives, have you asked yourself … Is this the right timing? What will happen if you waited 6 months or a year? What opportunity will you miss if you don’t implement now? Might you be too early or too late? If you want to learn more about how to discern right business timing, I recommend William Duggan’s book Strategic Intuition and Sun Tzu’s book, The Are of War. Both should be in every executive’s bookcase! QUESTION 7: What are your blind spots? What are you missing? Every one of us has blind spots. Our brains filter out over 99% of outside information because of its limited processing capacity. Such brain limitations create distortions in your thinking and perceptions. At a leadership and company level, blind spots are costly and sometimes catastrophic. Even the best leaders are challenged by unconscious persistent blind spots. Below are common blind spots from my work with leaders and organizations. Check how many of these blind spots are or could be true for you. Remember: You may have a blind spot about your blind spots :)). BONUS QUESTION: What is YOUR overarching question for the new year? What one question – if you asked daily — will help YOU move the needle in a key area within yourself and/or your organization? What values drive our customers’ buying decisions? How can we craft our products/services to those values, thus creating repeat customers? Questions are the ultimate leadership tool for moving the needle, regardless of the goal or challenge. Now it’s your turn to develop your own list of powerful questions. Drop me an email if you have questions about how to develop powerful questions :)). Posted by Denise Corcoran on January 27, 2016 in Goal Achievement, Leadership Development, Leadership Performance, Mindset, Motivation, Organizational Performance, Strategic Thinking and tagged culture, inner game, leadership performance, mindset, motivation, neuroscience, purpose, reflection, results, strategic thinking.